Hi everyone. Did you miss me? I had to put a lot of other writing (and other things) aside to finish and edit my new book but now that it’s all in the publisher’s hands, I can return to this blog. There is fun and freedom in writing a couple hundred words unconnected to another 60-70,000. I plan to post here regularly again so feel free to subscribe to the blog or to my revamped newsletter. I know that looking at the previous few entries doesn’t inspire confidence – is there anything more sad and lonely than a non-updated blog? But you know how it goes… with a full-time job, family, and writing a book, something had to give for awhile. I am really excited about the book. It started as an idea (thanks Laurie) that to understand cheese in America, you have to understand cheddar. Cheddar was America’s most popular cheese for 150 years, it was the first non-regionally-specific factory cheese, it begat the popularity of processed cheese (and later, cheese food), it affected – and was affected by – America’s food safety fears, and, really, almost everyone loves some form of it. In fact, you should go pre-order it right now. I’m working on events, readings, cheddar tastings, and all that stuff but since it doesn’t officially come out until October, I am also looking to just have some good old cheese talk here. It’s good to see you all again. This entry was posted in Uncategorized and tagged cheddar, cheddar - the book, cheese, Chelsea Green. Bookmark the permalink. This looks amazing. I can’t wait to read another wonderful tale from you! Chris is not with CBF any longer, but I hope I can get together with you and our new GM, Jeff DiMeo (formerly Forever Cheese) at ACS. Thanks! It will be great to see you folks. I can’t believe it’s only a couple of weeks away. Congratulations on your book. I look forward to reading it. Having just come back from Neal’s Yard working as their cellar manager for two years, I realized VT had great potential for natural rinded cheese. So I got on a mission to increase natural rinded cheese in VT. We had just built the cheese cave at VT Shepherd and had extra room in the beginning, which was the first built cave in VT.
Mariano Gonzoles, of Shelburne Farms at the time, Jamie Montgomery of Montgomery Cheddar in England and I sat down over a beer at the ACS conference in Hyde Park, NY in 1996 and talked Mariano into making a clothbound cheddar. He bandaged three10 pound prints, I aged them and we send them to a blind tasting held by Neal’s Yard. It came in first! It built from there. Cabot put about 100 clothbound 3# truckles in our cave , Shelburne had around 200 daisy wheels, then Grafton hopped on board. We also did test aging for Orb Weaver and VT Creamery. Thus, the rebirth of VT clothbound cheddar began. I left VT Shepherd 7 years later and Jasper Hill continued the mission. I wish I’d had a chance to talk to you before I finished writing this. 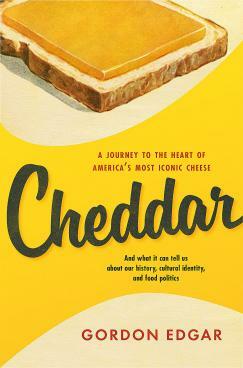 The story of the re-birth of clothbound cheddar in the US is one of my favorite parts of the book.